So, pretty much every recipe I looked up for this dish started with the same phrase: "This is Mexican street food at its finest. Anytime I visit El Paso or Mexico the craving of Elote en Vaso steps into high gear." I felt it was worth repeating here, even though I've never been to El Paso or Mexico, and I'd never eaten elote before. Instead, I just saw it on Instagram the other day, and it looked amazing, so I tried to make it. As a result, I'm not even really sure if this is supposed to taste the way it did, or if it's actually amazing and I just made it wrong. Either way, I wasn't super impressed by this dish, but, as Roger pointed out, it would probably make a delicious side dish for lobster, if you're into changing up the normal side dishes for lobster. * So, make this, or don't. Or, better yet, if you have a recipe that you know for sure is delicious, send it my way. Bring a large pot of water to a boil. 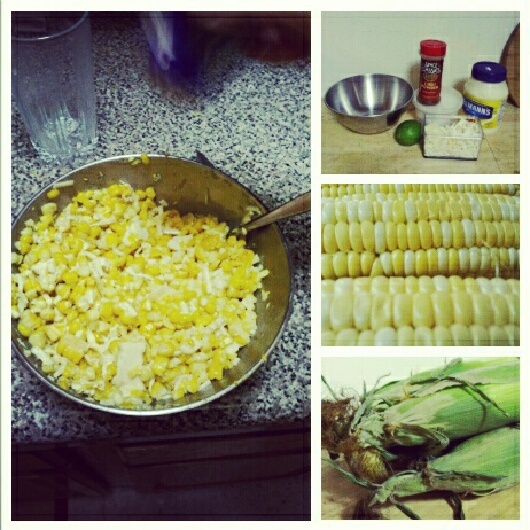 While waiting for the water to heat, shuck the corn. Boil the corn for 30 minutes or until done. In the meantime, mix together the remaining ingredients. Once the corn is done, cut the kernels off (you may need to run them under cold water first so you can easily handle them), and stir into the mix. Enjoy! *Will I ever eat lobster on the beach this summer? Unclear. If I was, I would probably just eat my normal buttered corn-on-the-cob and a baked potato. Or a lobster roll, all by itself. Oh my. -- We are planning to go to the Rockaways and eat tacos this weekend though! That sounds pretty fabulous! I would love to eat lobster on the beach with you. What are you up to? What is your status? Why don't we ever talk any more?